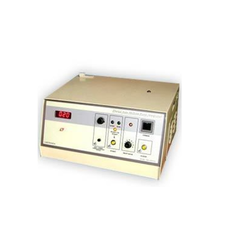 Digital Automatic Melting Point Apparatus is designed for quick and accurate detection of melting point. Feature packed & easy to use. This is an indispensable bench top tool. This equipment has an arrangement to hold the capillary containing the sample in uniformly heating media. The temperature is indicated on a digital display readable in 1.0° C. At the point, when the sample melts, the heating is automatically cut-off and the digital display showing the temperature remains on the indicator till it is cleared. No Silicon Oil or other bath is required as heating media. Range 2.0°C above room temperature to 350 °C. Glare-free background light with adjustable light intensity. Accessories Capillary Tube - 100 No. Cleaning Tool - 1 No. Digital Automatic Melting Point Apparatus is designed for quick and accurate detection of melting point. Feature packed & easy to use, this is an indispensable bench top tool. This equipment has the arrangement to hold the capillary containing the sample in uniformly heating media. the temperature is indicated on a digital display readable in 1.0 C. At the point, when the sample melts, the heating is automatically cut-off and the digital display showing the temperature remains on the indicator till it is cleared. No Silicon oil or other bath is required as heating media. Range 2.0C above room temperature to 350C.